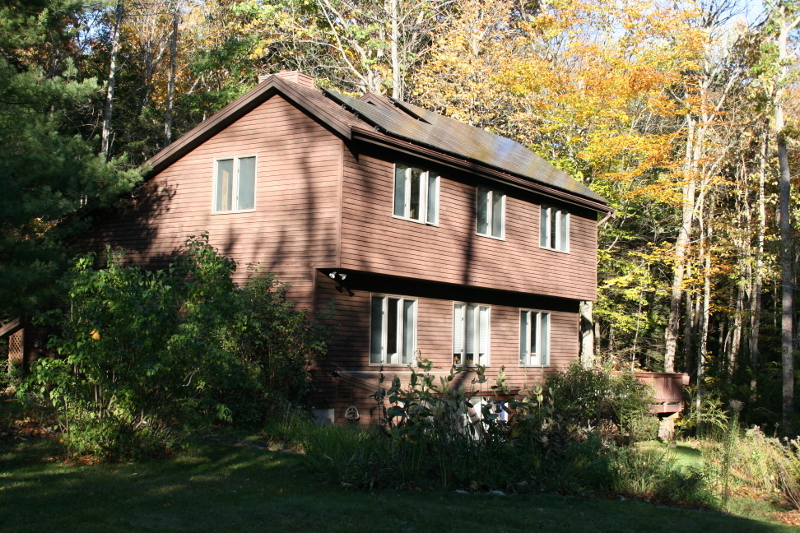 My brother’s house in Lee, New Hampshire, was built in the early 1980s as a low-energy home. The house has double-stud walls. His photovoltaic array was added to the short south-facing roof pitch in January 2016. I was at my brother’s house in Lee, New Hampshire, recently and looked up to see that his photovoltaic (PV) panels looked a bit dull (see Image #2 in the slideshow). His PV array is easy to get to—the long north slope of his roof has a walkable 5:12 pitch—so we went up and took a closer look. But I just could not resist digging a bit deeper. Do PV companies factor in anything for soiling when predicting PV output? ReVision Energy has offered to run its HelioScope model for my brother’s PV array, but they haven't completed the computer run yet. I will post the HelioScope results to this blog post when we get them and particularly what they decided to use for annual soiling losses and why. Has anyone ever collected field data on soiling? This took some real digging, but yes, the Sacramento Municipal Utility District (SMUD) as well as researchers from the University of California–San Diego found representative annual PV output losses of approximately 7% due to soiling. (See the NREL report “Best Practices in Photovoltaic Systems Operation and Maintenance.”) Since the studied sites were all in the West, ranging from San Francisco Bay to the U.S.-Mexican border, areas with more precipitation would most certainly have even lower typical annual losses. One international study—“Effect of Dust Pollutant Type on Photovoltaic Performance” (published in Renewable and Sustainable Energy Reviews, volume 41, 2015)—showed that the type of dust can make a big difference in soiling impacts (see Image #3 in the slideshow). And the NREL report cited above identified bird droppings as particularly problematic because rain does not clean this material from panels (see Image #4). When might it be worth cleaning? It is no big surprise that the size of the array and its location figure significantly into whether or not cleaning is worth the effort. For a multi-megawatt PV installation, it can be worth cleaning the panels for a 7% increase in output. And ground-mounted arrays (the typical type of array used for most large PV installations) can be much easier to clean than roof-mounted ones. A bar graph and list of bullet points from a DOE Office of Indian Energy report, “The 5-Step Development Process; Step 5: Project Operations and Maintenance” (see Image #5), gives tips on optimizing cleaning schedules for large ground-mounted arrays. How do you clean big arrays efficiently? There is no shortage of approaches: tractor-mounted cleaning arms (see Image #6), robot vacuums (see Image #7), track-mounted cleaning racks (see Image #8), and good old elbow grease (see Image #9). Research is being conducted on coatings or electrostatic charges that will keep PV panels clear of most types of dust. (For more information, see a 2017 article, “Reducing dust effects on photovoltaic panels by hydrophobic coating,” published in Clean Tech Environmental Policy, volume 19, pages 577-585). But none of these coatings that I found were ready for prime time. I was tempted to give Martin the final rather than the “starting” word on this, but I get the final word this time. If you have a ground-mounted or easy-to-access rooftop PV array and long periods without rain, you should think of PV panel cleaning as way more important than washing your car—but maybe less important than watering your garden. If you have a large PV array that sees a significant steady source of soiling (such as bird droppings, nearby dusty roads, etc. ), you should look to panel cleaning for increased output. For all other situations, how you prioritize PV panel cleaning is likely to be correlated with how nice your car is, or how fastidious you are in general. Tilt is one aspect not mentioned in this otherwise excellent article. A pioneering PV installation in rainy western Oregon installed a phenomenal number of panels (for that time) with no tilt absolutely dead level - on the advice of a New England-based consultant. Nearby Douglas Fir trees fill the resulting puddles on the panels with pollen, needles, and mold. Without cleaning, the output reduction must far exceed 7%. So if you want your panels to be self-washing, tilt them (and pick up the added benefit of more efficient solar collection). Another consideration is that in much of the west, the prime solar generating season coincides with the dry, dusty season. This leads me to believe that a mid-summer cleaning session would be a good idea.